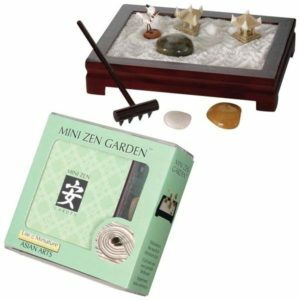 The Zen Garden is a version of the traditional Japanese meditative garden done in miniature. Perfectly sized for your desktop or coffee table! Arrange the polished stones on white purified sand and use the two rakes to create patterns and set your mind free. Also includes a meditation booklet with useful instructions and suggestions for shaping the garden. 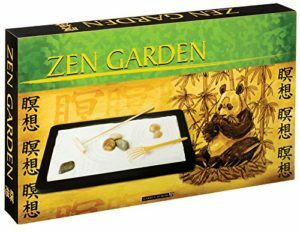 Kit includes two natural finish rakes, assorted polished stones and white purified sand contained in 11.5-inch by 7-inch wood frame. Just as much peace potential within an even smaller space! Place the three ceramic figurines and river rocks (islands) on the white purified sand (ocean). Rake meditative patterns in the sand and let your creativity flow.